The field proven Rugged Systems™ UPS line is ideally suited for military,industrial, computer and telecommunications applications requiring high reliability, rugged construction, compact size and light weight design.These units are equally suited for use in shipboard, airborne, vehicular, fielddeployed or fixed locations with controlled or uncontrolled environments. The"N5 Series" was specifically designed to save rack space andinstallation costs while enhancing the functionality of both the UPS and PDU.The "N5 Series" does not require a separate PDU since the PDUfunctions are already integrated into the UPS module. This saves rack space,cabling and expense while improving overall reliability. 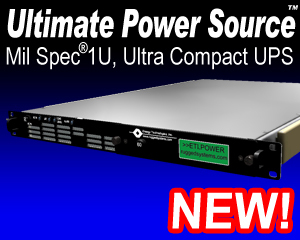 The heavy dutychassis occupy only 3U of rackspace while delivering up to 1550 VA of clean, uninterruptible power. The roundedmetal corners and rugged handles, both front and rear, aid in safe handling. The optionalmounting kit includes flanges and legs for either horizontal or vertical positioning.Internally, all major components are well secured and electrically insulated to preventdamage due to shock and vibration. An internal transformer bay accommodates the inputisolation transformer with provisions for both domestic and optional internationalvoltages. The LED arrays keep the operator informed as to the unit's status including loadand battery levels. The high intensity audible alarm can be heard in high noiseenvironments, yet is easily adjustable to suit quieter conditions. All controls andprotective devices are brought to the front panel with critical switches or breakersguarded. Further, all front panel devices are recessed to prevent damage or accidentaloperation.